ways the space-age Sputnik silhouette takes modern style to new heights. 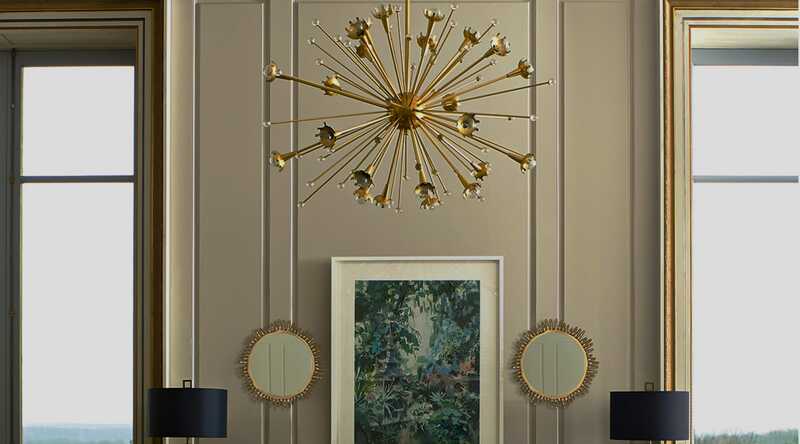 One of the cornerstones of mid-century style is the Sputnik pendant. Named after the first satellite to orbit the earth in 1957, the Sputnik silhouette quickly took off as an homage to space-age/atomic objects, and its iteration as a pendant light has been popular since. Today’s versions come in all sorts of configurations, but the foundation is the same: Long arms bursting out from a round center like an explosion of light. This starburst look is a great statement-maker over a dining table, in an entry way or even in a bedroom with high enough ceilings. Sonneman’s Orb collection gives this mid-century style an urban edge, thanks to a black metal frame and clear globe bulbs that are somewhere between Edison and Mad Men. The simplicity of this globes-and-stem style looks dynamic and exciting because of its unexpected angles and glossy finishes. An ultra-luxe eruption of light, with fluted glass rods that add a crystalline opulence to the Sputnik shape. The fixture’s bulbs sit in the center between the glass rods, reflecting the light between the glass and the metal center to create jewel-like sparkle and dramatic shadows. We love the retro-inspired elegance of this pared-down Sputnik-style chandelier. The satellite effect is somewhat abbreviated but it’s still a striking silhouette with plenty of mid-century flair. The entire Pontil collection by George Kovacs has a decidedly futuristic feel, with each iteration of the design toeing the line between glam and retro. This fixture from Hammerton Studio might be just as at home in a traditional living room as over a modern dining table. Its mixture of metal and crystal is anything but traditional in itself—not to mention that stunning silhouette—but its upscale detailing and craftsmanship lend this unusual look an air of luxe sophistication. This iteration is pretty true to the beloved Sputniks of the vintage era, but swathed in the retro-meets-luxury aesthetic that Jonathan Adler is known for. As pictured here and above, it suits both minimalist modern and new traditional styles. Sputnik-inspired shapes continue to inspire designers, and we expect to see more styles and innovations on the horizon. Such a highly regarded design is at home just about anywhere you put it, with variations to suit a wide range of aesthetics—it’s as easy as choosing your favorite.